This NASA satellite image, released September 2013, shows Tropical Storm Gabrielle (Upper R) closing in on Bermuda. Forecasters said the storm, which was some 120 miles south of the island, was strengthening and approaching. MIAMI, Florida (AFP) – (AFP) – Tropical Storm Gabrielle was battering Bermuda with heavy rains and powerful winds, as US forecasters warned it was strengthening and moving closer to the popular vacation spot. Gabrielle, with maximum sustained winds near 60 miles (96 kilometers) per hour, was some 30 miles (45 kilometers) south of Bermuda, the National Hurricane Center said. 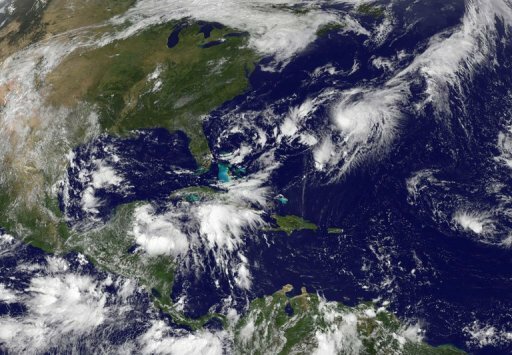 “Tropical storm conditions occurring on Bermuda as Gabrielle approaches,” the forecasters said in a 0000 GMT advisory from the Miami-based center. Winds have already picked up on Bermuda as Gabrielle — which could strengthen further over the next 48 hours — slows and turns toward the island chain, they added. A tropical storm warning was in effect for the tourist haven, which could see up to six inches (15 centimeters) of rainfall and storm surges of two to three feet (0.6 to 0.9 meters) above normal. Meanwhile, fellow Tropical Storm Humberto, churning far off land in the Atlantic, appeared on the cusp of becoming a hurricane. Packing maximum sustained winds near 70 miles (110 kilometers) per hour, Humberto was about 245 miles (400 kilometers) west of the southernmost Cape Verde Islands, the NHC said. “Humberto (is) almost a hurricane,” it said in a separate 2100 GMT advisory, adding the storm could surge to hurricane force either later Tuesday or Wednesday. However, no coastal watches or warnings were in effect.